These shears provide cutting performance unmatched by other brands. A unique locking/unlocking feature allow you to open and close the shears with one hand. Blade angle is key to clean cuts. 1-7/8" pointed blade. Ideal wherever precise control and very clean cuts are required. For bonsai, floral, propagation and thinning applications. 7-1/2" length. Excellent for shaping and wherever tight quarters limit movement. Total length: 21". 12" handle. 7" blade. These shears feature a 1-7/8" pointed blade. 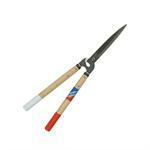 The long lasting sharpness makes this an excellent softwood propagation tool.